On Thursday afternoon, together with Alida, we took one of the team cars and drove to the tiny village of Paicu in the south of Moldova. For a while I have been promising to pay a visit here and the opportunity has finally come. 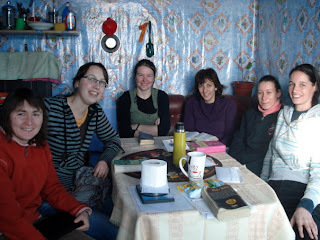 We have a Local Ministry Team of five women who are serving the Lord here and in the surrounding villages. The stories from this village are stories of broken lives and tragic situations as well as stories of God's grace at work bringing new life, reconciliation and hope for the future. As we worshipped that evening with the small church in their new building I was especially touched by the testimony of one young man who stood up and shared just a few brief words. I knew that a couple of years back, one of our team members had spent time with him regularly teaching him to read. As he stood before the church, he gave thanks to God for the courage and the voice to stand up and testify. Then he did an amazing thing - he lifted up his Bible and read a verse from John 14 - 'Nu va voi lasa orfani, Ma voi intoarce la voi.' (I will not leave you as orphans, I will come to you.) He read the verse. Just a couple of years ago he couldn't even read. Living in a home with alcholic parents, he had not gone to school as he had to stay home and help around the house while just one of his siblings attended school. Even now, I was told, alcoholism continues to play havoc in their home, where he is trying to live as a Christian. For all intents and purposes these children had been abandoned by their own parents, not given the love and nurture and encouragement that every child should have. But one day he had discovered that his heavenly Father had NOT abandoned him. Though he might have felt like an orphan, he was not an orphan. His is just one of many lives that have been transformed in this community over the years since the beginning of the church there. Now there is a church, a community centre/church building, a Day Centre for children, a meal program for the elderly, food packets being delivered to the poor. Our team serving there alongside the fledgling church is reaching out to the community itself as well as several other communities in the area. Among many other things, each week a few of our team members go to the local kindergarten to conduct a brief program for the children there. It was my privilege to go with the team to the kindergarten to observe their involvement and even to help out a little by playing the guitar. It was a joy to see the darling children and to meet their teachers and be able to invite them to the upcoming women's event for the International women's Day on March 8. The event will actually be on the 7th. How do I know that? I know that because I have been invited to share my story on that day. I pray, and I ask you to pray for me, that the words I share will help to convince others that they are also not abandoned or forgotten or forsaken by the Lord, but rather loved, cherished, and precious in His sight, just like the children are. Walking down the muddy street in Paicu, I gave thanks to the Lord for all the ways He is bringing hope and new life to this village. Posted by Barb at 8:13 p.m.